I have extensive experience in hospital visitation as both the visitor and visitee. 2 people taught me how to visit: 1) Mom – she took me along with her to visit folks when I was a child, but the first time I really remembered going to visit an ill friend was when I was a young teen on summer vacation. Mom treated it as a natural thing to do so I always thought of it as such – you go see friends, especially if they are sick and might need some cheering up. 2) My “adopted” Grandma E – She and Mr. E were always the first ones at the hospital when anyone was sick. She’d have a potted plant in one hand and The Little Flock Hymnal in the other, prepared to wile away the waiting room time by singing a few songs. I think the way Grandma E visited might have been somewhat of a generational thing, and the way I visit(ed) might be a church-phenomenon. It takes a while for people to get used to each other enough to welcome a visit when illness strikes, and those relationships are often forged at church and the visits paid/received in that context. Everyone, though, regardless of background, will likely have sick loved ones who would like a visit at some point. I was comfortable in the hospital before I got sick since I had spent significant time there visiting family and friends. I didn’t visit the hospital in OR since I was still getting to know people and didn’t want to weird them out. Visiting can take place in a medical facility or the home, and I enjoyed home visits very much and called on the hospitality of others as often as I could. One day we were in the car while I was visiting the J family in Africa. Me: Oh yeah – I invite myself over about every other week, and your grandma’s really very good-natured about it. All kidding aside, visiting in any context can be hard (what do you do/say?) but can also be a bright spot in a person’s day, and yours, too. I had oodles of visitors while I was an inpatient – thank you all! And have since issued a few blanket apologies for any and all misbehavior that might have occurred on my part. When it was my turn to be visited I found out I wasn’t very good at it. To be clear, I was not lucid (most of the time) and I was so appalled by the whole situation I seriously thought I might expire at any moment. One story in particular has stuck with me. At the second hospital a lovely lady, JA, came to see me with a couple of her kids. I wasn’t truly awake yet, but I was moving around, although unable to talk. During those few days Mommy says I was incredibly agitated. I remember lifting my legs up into the air and bringing them down full-force onto the bed/railings. WHAP! I can still hear it. My family was grateful I had the ability to kick, but they were sad to see me so frustrated. As I was thrashing about, JA read the signs of my agitation and very discreetly bowed out of the room since I was obviously not up for company. It was so kind of them to come, and I’m pretty sure the hospital wasn’t a convenient location – so I’ve appreciated every (attempted) visit even though I might not have shown it at the time. This kind of discernment is key to good visiting. This is the first general tip I’ll state – you have to read the situation constantly as you go. If you’re at the hospital, a doctor/nurse might come in and need to do something. Give them and the patient privacy, but don’t make a big deal of it. Also, just try to be attentive to the patient’s condition in general– do their eyes look tired? Is it mealtime? This will influence the duration of your visit. 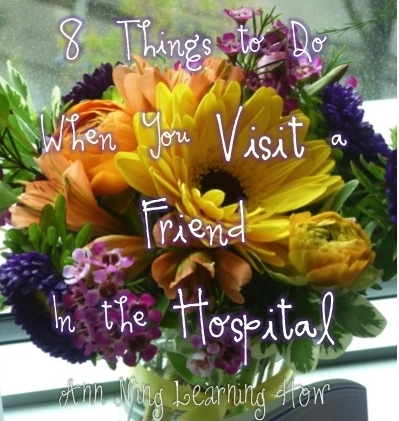 First of all, though, you will probably have cleared your visit with a close friend/relative to make sure the patient is receiving visitors in the first place. And please, do not be offended if the person is not seeing anyone. One of my nurses, J, put a huge stop sign next to my door at RIO (3rd Hospital) that said, please see the Nurse before entering. She also decreed that visitors should come after 4pm so I could concentrate on my Therapy during the day. She was so nice – she told me she didn’t want to over-step – but I told her, “thank you,” because she directed traffic when I was unable to so I could prioritize. Personal Grooming – you can do hair and nails; please don’t get all excited with a cuticle trimmer, though, unless you’re a professional. Just rub some cuticle cream/oil in, maybe some buffing would be good; the ladies might like some light colored polish, or some crazy colorful polish, if that’s their thing. Picture Time – bring a large picture book with you, or perhaps a slideshow on your tablet/phone. Reading is more taxing that looking at pictures. I used to check out fun books from the campus library for Mrs. R – e.g. on the history of the dress, so I could just leave the books with her and monitor the due date on my own. May I read to you? – if the patient is able to listen, they might like to be read to. The scriptures are often requested in my experience, and it is always good to have a few passages earmarked in your mind to suggest. The patient might also enjoy something else – if you’re friends in “normal” life you probably know what they like – go ahead and bring a magazine or book just in case. Bring in Live Entertainment – this only worked for me since Mrs. R. was so gracious as to welcome some (charming) strangers into her hospital room (by pre-arrangement). I recruited 3 friends to sing her some songs since they all have lovely voices and one of them plays the guitar. One of my doctor friends used to bring his own guitar in to serenade some patients while he was a resident. Being unable to sing myself (especially now), I had to enlist my friends’ help – but if you can do this on your own, it can be wonderful. I remember people singing for me, and I know my parents were really encouraged by it. Gift shop & Special Events – Most hospitals have a gift shop and there is usually a calendar of special events, e.g. a book sale, linen sale etc. You can go window shopping. Pediatric Art Therapy Room – some facilities might have a place where pediatric patients are encouraged to heal through art. Looking at their work will be nice – however, you’ll want to pick a time when the kids aren’t there (you don’t want to expose the kids or your friend to new germs), and you’ll have to find someone to say it’s okay if you poke around a bit. 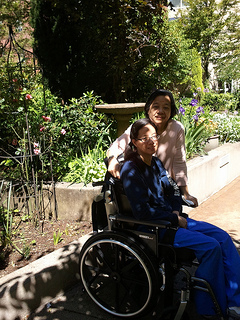 Outside – I loved the Healing Garden at RIO (3rd Hospital) – it’s where Mom told me that yes, this situation was for real, but I remember it more for being the place where I ate sweet potato French fries on a break with my parents, and where I sat with M (OT3) on my last day as an inpatient. I am also drawn to the Therapeutic Garden at Planet Rehab. If there is no garden, any patio will do – just make sure you’re not going through any emergency exits and that you have a plan for reentry. Great tips, Ning. Visiting is such an important ministry and I’m thankful for the example of Mom and Dad in the many years of visitation they have done and continue to do. I love that you explain how you learned this as a child from going along w/ Mom on visits and that it was just the normal thing to do. I’m also thankful for you and the example you’ve been to me in this realm in your adult life. This post is a good push for me to continue to teach this to my kids and practice it regularly. XOXOs! Such good and helpful advice!!! I think I told you this before, but when you were first sick and all the way in OR I remember thinking the ironic thought of, ‘this is a time I would go to Ning for what to do!’ I’m thankful the Lord provided so many people to be around you. Also, I look forward to the visiting basket post. Girl, you do know how to pack a basket and visit! I second and third the comments above. 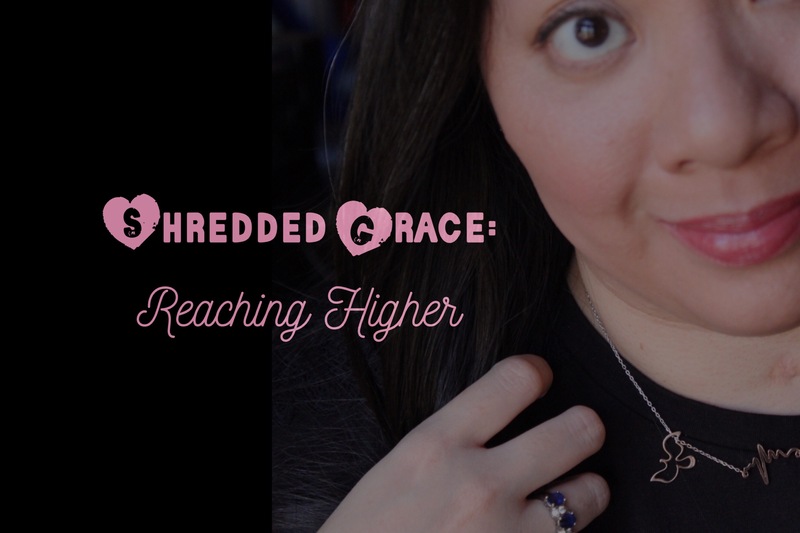 SO good to hear your “insider tips,” both from the visitor & visitee perspective. For many years I’ve often wondered how you knew what to do as a visitor. You mentioned Mrs. E… perhaps you know this, but Mr. & Mrs. E were the first to arrive at the hospital (after my Mom, who followed the ambulance) when Dad had his heart attack. They were sitting with my Mom when my siblings & I arrived. Never will forget that.